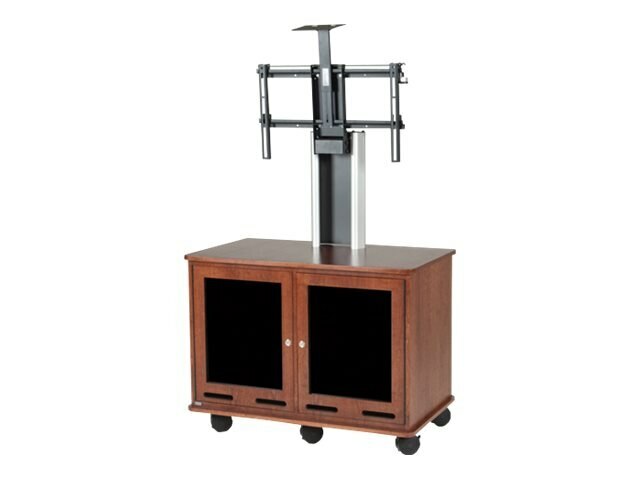 The Video Conferencing Equipment Rack Cart - Single is a mobile solution for professional video conferencing sessions. It supports one monitor up to 100 pounds, and provides five degree backward tilt and fifteen degree forward tilt. The cart also features a camera shelf. Four vents and two fans allow for adequate ventilation. Two locking doors and a locking rear access panel provide security for the twenty-eight rack spaces inside. Each side of the cabinet has a six-outlet power strip.